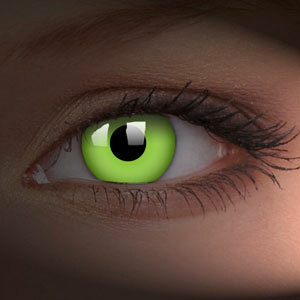 Make your eyes stand out with our amazing colour contact lenses for Halloween. You will love our wide range of spooky lenses which will look great with your makeup, accessories and costumes. Choose from our selection of colours, life spans and designs which will ensure you get both comfort and style. Have some fun and enjoy wearing our amazing Halloween contact lenses to all your fancy dress parties. Make a bold statement in these shimmering green coloured contact lenses. Below we have some amazing green dragon contact lenses which have a bright yellow burst that will instantly light up your look and scare all your family. In the centre there are some frightening green stitched effect Frankenstein lenses which will turn you into the popular green monster. Or if you prefer a glowing look then our green UV lenses are perfect for you! Whatever contact lenses you choose you can be sure you will get fantastic quality and value. Everyone will be surprised with your fabulous lenses which will make the perfect finishing touch to all your favourite Halloween costumes. Freak out your friends with these amazing red Halloween contact lenses, perfect for spooky fancy dress parties. Everyone will be amazed with your quick transformation and will love a pair of bright red contact lenses. Below we have chosen three of our favourite lenses which will look great teamed with absolutely any costume and accessory. Make sure you have a night to remember with these fabulous red contacts with a life span of 1 year once opened. You will be able to enjoy nights of fun and excitement with these comfortable and fresh lenses which will compliment your dramatic costume makeup. Choose from our eye-catching selection of block coloured, I love Lucifer and cat eye lenses which will instantly open up your eyes and leave you glittering with style. The fantastic detail and exceptional quality will always keep your eyes feeling hydrated and cool for hours. Make sure you snap up a pair of these bargain lenses which will coordinate with your favourite scary costumes. This entry was posted in Contact Lenses and tagged Cat Contacts, Cat Eye Contact Lenses, Cat Eyes Contact Lens, Cats Eye Contacts, color contact lenses, color contacts, colour contact lenses, colour contacts, Coloured Contact Lens, Coloured Contact Lenses, Coloured Contacts, Coloured Lenses, Contact Lens, contact lenses, Costume Contact Lenses, Halloween contact lens, halloween contact lenses, Novelty Contact Lenses, Red Contact Lenses, Red Contacts, scary contact lenses, ultra violet contact lens, UV Contact Lens, UV Contact Lenses, UV Contacts on October 18, 2011 by Piercing Guru. Make sure you get noticed in clubs or wherever you like to hang out, by wearing Glow In The Dark Lenses. The Glow In The Dark Lenses will glow under UV light, in an attention grabbing manner and even in normal light they look fantastic. Glow In The Dark Lenses come in a variety of colours such as white, purple, yellow, orange and pink, meaning that you can personalise your look effortlessly. These vibrant Pink UV Glow In The Dark Lenses beautifully capture a dazzling tone of pink which looks stunning both in daylight and of course whilst glowing in UV light. When wearing the Pink UV Glow In The Dark Lenses at night you can get quite a reaction from onlookers, whilst creating a scare to those who are not suspecting you. You can wear the Funky Eyes Pink UV Glow In The Dark Lenses for Halloween, birthday parties or other special occasions. Wearing these glowing Yellow UV Glow In The Dark Lenses you can very easily make a bold fashion statement, wherever you are. The Yellow UV Glow In The Dark Lenses look best in the dark with UV lighting, but they also look captivating during normal daylight and artificial light. As these Yellow UV Glow In The Dark Lenses are made by ColourVue, they are made from superior materials and will keep your eyes healthy and shining all day long. The Yellow UV Glow In The Dark Lenses have great oxygen permeability, this keeps your eyes well hydrated and comfortable all throughout the day. This entry was posted in Contact Lenses, Fashion Accessories and tagged glow in the dark accessories, Glow In The Dark Lenses, Glow In The Dark UV Contact Lenses, ultra violet contact lens, UV Accessories, UV Contact Lens, UV Contact Lenses on June 10, 2010 by Piercing Guru.